A woman claiming to have suffered stigmata -- the injuries Jesus suffered when he was crucified -- has become the subject of hot debate. People in Samoa are divided in belief after a 23-year-old woman was pictured with wounds on her feet and the palms of her hands. Media named her as Toaipuapuaga Opapo Soana'i, and she bore injuries to her side and forehead. The wounds mirror those Christ suffered before and during his crucifixion. His side was pierced and a crown of thorns was pushed on to his head, causing him to bleed. The woman, who is the daughter of a church minister, told local media she began seeing visions days before Easter. She played the part of Jesus in a Sunday School Easter play, during which church members noticed wounds appearing on her body. Video footage of the play show congregation members approaching the front of the church, where she had collapsed, to fan her. Her claims have sparked huge debate in the highly religious island nation. Members of the public have taken to social media to discuss the authenticity of the woman's claims. Many people are backing Ms Soana'i, calling the event a miracle. If this is not enough to make one believe, then I don't know what else to prove to the unbelievers and evil-doers," one woman wrote. "Believe and have faith. Stigmata is for real. I'm envious of this young woman," another wrote. Many others, however, are skeptical, and many are calling the woman a hoax. One man said people were become gullible and blind. 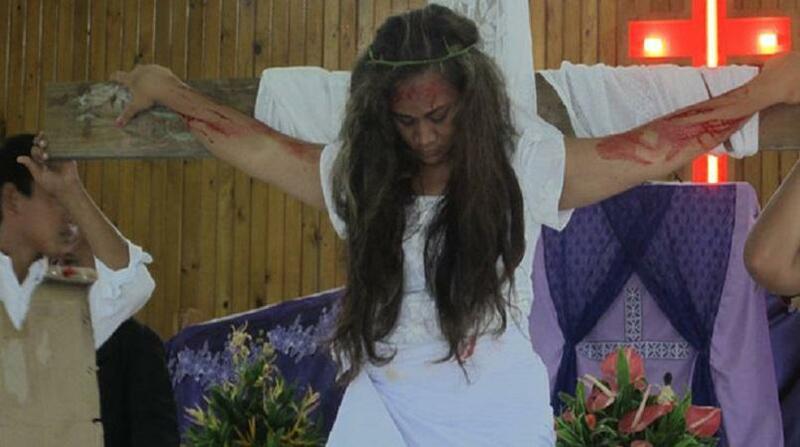 "My newsfeed is blowing up with this stigmata case in Samoa. I dunno. Let's take it with a grain of salt," he wrote. "This could likely be just a very vulnerable girl who is self-harming and we're just feeding into the delusion." Another said: "Most stupidest thing I've ever seen. For one, Jesus died once and for all, so that we don't suffer and be spiritually dead. No human being can ever fathom the pain he went through when being crucified." Video footage of Ms Soana'i, who spoke to TV1 Samoa about her experience, was posted on the group Samoa Mo Samoa. As of this afternoon, the footage had been viewed more than 20,000 times and attracted hundreds of comments. Cases of stigmata have been heard of in many parts of the world over the years, particularly with people connected to the Roman Catholic Church.